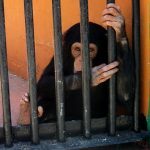 Are chimps legally entitled to the same rights as humans? YES! Magazine highlights a recent story involving personhood for chimps. YES! Magazine’s Susan Gleason speaks with Senior Editor James Trimarco.